Where to Buy Dip N Grow, Dip N Grow Rooting Hormone - 16 Oz - Gallon - $44.95 for Sale with Fast Free Shipping! Dip N Grow Rooting Hormone - 16 Oz - Gallon is a cloning solution that is self sanitizing due to its alcohol content, eliminating cross contamination. 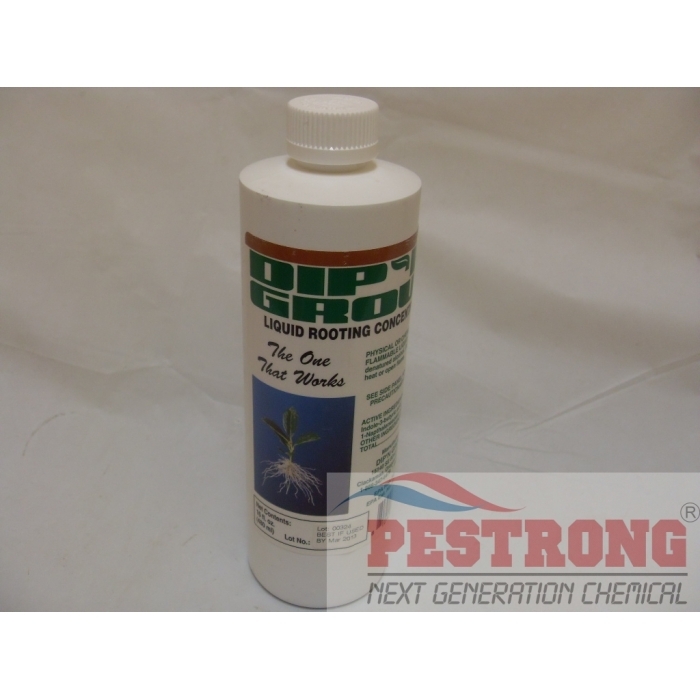 Dip N Grow Rooting Hormone - 16 Oz - Gallon is a cloning solution that is self sanitizing due to its alcohol content, eliminating cross contamination. You'll have more success than with a powder. For use on ornamentals only. Mix only for immediate use. For best results once diluted, Dip 'N Grow should be used within 10 hours. Read and follow the directions for use and precautionary statements printed on the bottle. This product is intended for commercial use only. Applicators and other handlers must wear: long-sleeved shirt and long pants, chemical resistant gloves, such as barrier laminate, butyl rubber, nitrile rubber, neoprene rubber, polyvinyl chloride, or viton, and shoes plus socks. Directions for using the dilution cup: As soon as possible after taking cuttings, prepare a dilute solution of Dip 'N Grow as follows: To avoid spilling, use scissors to cut the corner of the 0.2 ounce packet and carefully pour Dip 'N Grow into the dilution cup, or pour from the 2 ounce bottle to the concentrate line of the dilution cup supplied. For hardwoods, add water to the 5X dilution line. For semi-hardwoods, add water to the 10X dilution line. For softwoods or succulents, add water to the 20X dilution line. If you are doing more than one type of cutting start with the hardwoods so that you may dilute the solution to a semi-hardwood or a softwood dilution level later. Dip the basal end (bottom) of the cutting approximately one inch into the dilute Dip 'N Grow for 3 to 5 seconds. Following dipping, place cuttings into planting medium. (Vermiculite, perlite, pumice, or any coarse planting medium that drains well, works best). Awesome product, back for more! I've had nothing but good experience with DipNGrow, I recommend this to everyone I know! and this website has it for such a low price, very good. DipNGro is simply the best rooting compound that I've found. I always have very good success using it. This was a great price too, and very fast shipping. Cheers!